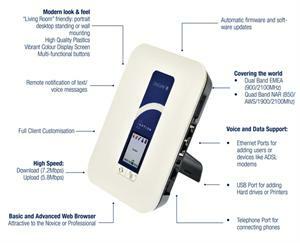 Option GlobeSurfer lll GSM Voice and 3G Broadband Data Gateway Router Has Been Discontinued. GlobleSurfer is a full telephone functionality, including composing, reading and managing SMS text messages. Hard drives and printers can be connected via the integrated USB port, enabling users to share or back-up files across the LAN, while a printer can be conveniently located and used by all connected PCs. The GlobeSurfer III is easy to use too, with just two buttons and a clear, color display screen, while unique Notifier software displays alerts and status information across the wireless network. Read More Details Click Here.